• 24 l x 1.25W Wraparound Handles • Seams are bound for added durability • Velcro Closure on top • Outside Pocket featured between reinforced handles. 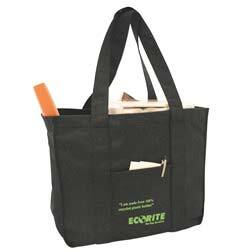 Made from non-woven 100% post consumer plastic. Imprint Area: 4.5 x 4.5"
Embroidery Area: 3 x 3"